I have been making pots of chicken soup for tallasiandude, who is feeling poorly this week. And since I have been buying whole chickens for that, I have had access to small amounts of chicken liver. Normally what I do is just fry it up and glaze it with a little balsamic vinegar, which is lovely. But this time, since I’d just done that YESTERDAY (tallasiandude eats a LOT of soup when he’s sick), I decided I’d make some chopped liver, Jewish-deli-style. So I fried some finely diced onion in a tablespoon of butter, put in 3 pieces of chicken liver once it was starting to brown, sprinkled in salt, and fried it till the onion was just about to burn, at which point I tipped in a little bit of sherry and let it cook till the liver was done and the liquid was syrupy. Then I put it into a bowl, ground on a little black pepper, and smushed it into a paste. I just put some of that on a cracker just now, and it is HEAVEN. We got some fish frames for free and I made two soups with ’em. First I made a big pot of fish stock, pulling out the fish once it was cooked and picking off the meat, returning the bones and skin to the simmering soup. Half the stock became a ghetto bouillabaisse, with only the picked fish meat in it along with the fennel and onion and saffron. Very nice, and much cheaper than the regular bouillabaisse we make for company. The other half became a Russian fish soup with potato, onion, mushroom, tomato, wine, garlic, dill, lemon and paprika. I used some Trader Joe’s mahi mahi and mixed seafood (scallop, squid and shrimp) since the free fish bits were all gone. This was very nice indeed, warming and refreshing at the same time. – we upped the spicy even a notch further than last year, and that did the job. the bottles of chili oil went very nearly untouched at the table. 3 chilis + 3 tbsp of peppercorns + 10 tbsp spicy bean paste for the mild version, which was actually a little spicy. 14 chilis, 4 heaping tbsp of peppercorns and 12 tbsp spicy bean paste, three of them of the spicier type, for the spicylicious version. 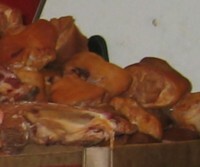 – we found beef shank at the Kam Man market in Quincy, which is far superior in this application to the stewing beef from Costco. Loads more fat and connective tissue, and it shows in both the moistness of the meat (at last!) and in the richness of the broth. – we finally sorted out the logistics of large-scale noodle cooking. We bought a couple of cheapo electric range-burners at Target, and had one pot of water coming up to boil while the wide steamer-pot base was cooking 2 packs of noodles on the stove. This staging kept the noodles coming at a steady pace without suffering gumminess of any kind (unless they got left in the colander untaken for a while). I’ve previously mentioned my love of clear broth soups. But my true love is actually noodle soup. For some, their idea of comfort foods are things like meatloaf, mac ‘n cheese — which I totally get. But growing up, on those cold, gray and rainy days in southern California (no, seriously), it’d be a bowl of ramen noodles that warmed me up. In high school, when we were allowed to leave campus, we’d sometimes have back-to-back free periods which would give us an hour and a half to make the half-hour drive down to Chinatown, eat at California Beef Noodle King and then drive the half-hour back just in time for AP E&M. Yeah, I love me some spicy beef noodle soup. There are several restaurants in the Boston area that serve nu ro mian (beef meat noodle), but none has ever been quite what I was hoping for. Tai Shiang Garden in Chelmsford was the first — a close enough approximation, but slightly off on both the broth and the noodles (they use what looks like udon). Chung Shin Yuan in Newton and Shangri-la in Belmont have both been pretty good — the broth is almost exactly as I’d like it (with some day-to-day variation), but they both use noodles that remind me of linguine. A few years ago, I finally decided to take measures into my own hands. I got a recipe for the soup base (beef/tendon and broth) from Mom and tried making it myself. Combined with some fresh noodles bought at the Super 88, we were pretty happy with the results. 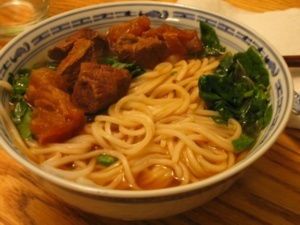 (I tried making my own hand-pulled noodles, but that experiment was an unmitigated disaster.) But we ended up with an awful lot of meat and broth. The solution? Invite friends! And thus, Noodlefest was born. The first year, we provided both the beef broth and a pork broth (made from Magic Hocks) for a secondary pork and pickled cabbage option for our non-red meat eating friends. No allowances were made for the vegetarians. (Sorry guys, but you can’t please all of the people all of the time.) We suffered through a few logistical problems — inadequate rate of noodle availability, bowl shortages, and the pork broth wasn’t quite up to expectations (guests were happy, we were disappointed) — but overall, things went well. 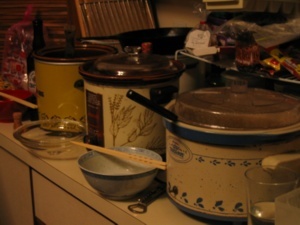 That year, we also tried to cap the number of guests, fearing that we’d run out of soupy goodness. It was close, but things worked out fine, and I think we ended up having soup noodles for an extra couple of days. Emboldened by the previous year’s success, this year, we decided to step it up a notch: open invite, make more food. We had a better handle on how much food we needed. We figured that we had ironed out some of the logistical problems that we had had with production. We even did a few preliminary trials of broth for the pork and pickled cabbage. Soy, wine, paste, garlic, peppercorns. 1. Cut beef and tendon into cubes and cook for a minute in boiling water. Stew beef is convenient here because it’s already mostly cut up for you. I ended up cutting some of the pieces down. I’d also recommend getting the tendon cut for you at the market. As an experiment, I tried cooking the larger pieces of tendon and then cutting them up after the first hour of cooking, but I don’t feel like the flavor got into the tendon as quickly, and it seemed to take a little longer to cook sufficiently. 2. Drain off the water and return beef to pot. Add boiling water to 2″ above beef. (I find it convenient to actually have 2 large pots of boiling water so you don’t have to wait for the water to come up to boil again.) Add anise, green onion and ginger. Use low heat and stew covered about 1 hour. 3. Heat oil in another pan, when hot add the garlic and peppercorns and stir fry till brown. Then add hot bean paste, soysauce and wine. Bring to boil, then lower heat and cook for 2 minutes. And now a word here about the bean paste. When we first tried to make this recipe, the bean paste was probably the hardest thing to get. Not because it was hard to find. No, the problem was that when we got to the sauce aisle in the Super 88, FoodNerd and I were confronted with a whole section of spicy bean pastes, different brands, different beans, different ingredients. We ended up leaving the store with two bottles and have since decided that Ming Teh brand broad bean paste with chili was the way to go. 4. 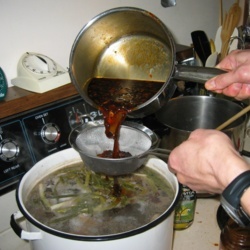 Strain oil mixture into the beef pot and stew until beef is tender. The original recipe said something like another two hours, but we’ve found that it takes about six for the tendon to really soften up. The pork noodle soup broth is a bit simpler. It’s a basic chicken stock supplemented with a little ham to round out the flavor. The goal was for it to have a rich, savory flavor while still being clean and light. I think the key ingredients are the ginger, cooking wine and white pepper. It’s got to be good and peppery. The above is only an approximation — we mostly did things by taste. We first par-boiled the chicken and ham the same way we handled the beef in the beef broth. It’s a nice way to get some of the gross stuff out of the meat. After replacing the meat into a fresh pot of boiling water (we topped off a 2-gallon stockpot), we added the green onions, ginger and cooking wine and then reduced heat to a simmer. We also made a second beef broth to supplement the primary stew broth. So, those were the broths. For the pork and pickled cabbage, we sliced pork (tenderloin? cutlet? steaks?) into thin strips and marinated in soy sauce, sesame oil, cooking wine and corn starch. This was stir fried at high heat and then added sliced up pickled radish and greens. This has been another difficulty — finding the correct pickled greens. We ended up using a mix of various types without properly documenting them. Sorry. And still we really haven’t found the same type that is used in the restaurant soups. It all comes together with the noodles. As mentioned, my chief complaint with the commercial sources of these dishes is that they use substandard noodles. That’s what it’s all about. It can make or break the dish for me. The previous year, I was trying to cook the noodles to order. I’d throw a bundle in for 2-3 people, cook them up and then fish them out. I’m not sure what I was thinking — like I was expecting a bunch of people to come in, and half of them would say something like: “Hey, noodles. Cool! Do you mind if I just hang out here and watch some of y’all eat?” Yeah, so cooking small batches of noodles one at a time — dumb idea. I’m inviting people to Noodlefest. When they show up, they’re all gonna want to eat noodles. I ended up spending a lot of time trying to fish out a bunch of cooked noodles while the water was still boiling, putting them straight into people’s bowls, and then putting another batch in. And as the evening worn on, not only had I scalded my hands a couple of times, but the cooking water got thick and cloudy with all the loose flour that was on the fresh noodles to keep them from sticking to each other. It was gross. At some point, we ended up dumping the water and starting fresh, which of course took more time. One of the reasons for this was a lack of burner space. I think we had two giant stockpots on the stove, a skillet with the pork and cabbage and then the pot for cooking noodles. And it was a tight fit since they were all oversized pots. One crockpot was dedicated to the chicken/pork broth. The other two were used to hold beef broth. The beef and tendon, topped with broth, went into a separate pot. And we precooked the pork and pickled cabbage and put it in a cassarole dish set on a warming tray. This freed up the stove for two pots in which to boil water for cooking noodles. While one pot was cooking noodles, filled to capacity, we could bring water up to boil in the second pot. 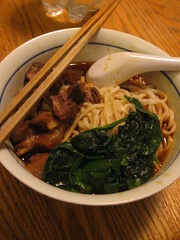 A third burner was used to cook down spinach in the beef broth. When the noodles were cooked, I strained out the water, dumped the noodles back into the pot with cool water to stop the cooking. That’s key: you don’t want the noodles overcooked — it’s important for the noodles to have a little chew to them. Then, serve into bowls, add spinach and beef (and tendon, for a few), and then top off with broth. Add a dash of chili oil if you want a little extra zip. Similar process for the pork and pickled cabbage, but we let the pork be serve yourself — I just doled out noodles and broth. A cold and snowy week in February: not the best weather for travelling, but perfect for some noodle soup. We had a few no-shows, but I think we still ended up with over 20 people. Sharing the love. All told, a good night. I love soup — broth-based soups in particular. It’s a comfort food for me; strange, I suppose, for someone who grew up in the temperate climate of southern California, but I guess it is what it is. Of course, now that I live in New England, I appreciate a bowl of nice hot soup even more so. 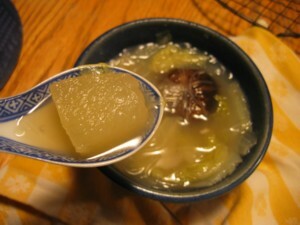 Growing up, Mom made two soups that I remember in particular: ham hock soup and wintermelon soup. To be honest, I don’t really have a clear idea whether these were actually two distinct soups or if she would just make ham hock soup and put different things into it, wintermelon being one of them. The memories of the warm savory broth and the delicate, semi-translucent chunks of melon go hand in hand. So when I think of one, I always think of the other. 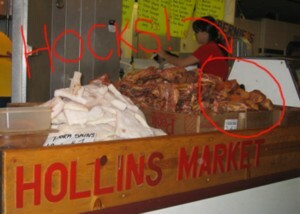 Recently, when we visited my friend DrJ down in Maryland and did a tour of the Baltimore public markets, we came upon hocks that were finally up to the task. We brought a few back with us, and have since had our small freezer cache restocked by her most recent visit. Wintermelon is also not particularly common, but we haven’t had any trouble finding it in most of the markets in Chinatown and have even found them at Russo’s, one of the local farmstand markets. So, with the weather turning cold, we decided it was time to make some ham hock wintermelon soup. And then it was on to the wintermelon. I’ve now read that you could just eat it raw, like watermelon, I suppose. It’s also interesting to discover that if you do a Google search on wintermelon, after asking you whether you’re really searching for “watermelon,” you’ll end up with a lot of pages about wintermelon soup. Foodnerd only found one thread on recipes that didn’t result in soup. So in went the bamboo shoots, wintermelon and cabbage. The stock (still with hocks) only filled the pot half way, so when I put all the other stuff in, all the wintermelon was submerged, but the cabbage kind of sat above the waterline, an island of vegetable. No worries, though. The volume reduces as the water cooks out of the cabbage, which also increases the volume of the soup. Now that’s win-win. At this point I also added the white pepper and salt. Last year, we tried to make a pork and pickled cabbage soup, but the broth just didn’t come out right. We’ve been looking over some of our Chinese cookbooks, and one of the things we noticed was that some of the recipes added ginger to the stocks. Something clicked, so Foodnerd managed to dig up some ginger root out of the freezer (maybe a 1/2″ chunk) and we threw that into the stock too. We let the ingredients cook up for about an hour. You can generally tell when the wintermelon is done because it takes on this cool semi-translucent appearance. But of course, you gotta do the taste test: it should be really easy to bite through, but still should have a little something to it — like a perfect al dente pasta, but then it should pretty much melt in your mouth. At that point, we figured we were done, but when we tried the broth, it still seemed to be missing something. Foodnerd suggested vinegar, but I didn’t think that could be right, especially since I think she’d suggest that for just about anything anyway (it’s her east-European pickle-lover side). We finally agreed on Chinese cooking wine. 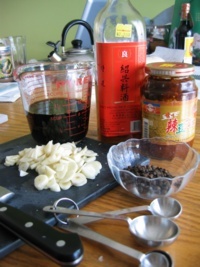 (we have a bottle of Shao Hsing rice cooking wine in the fridge for just such an occasion.) We tried a splash, then a few more and it rounded out the flavor nicely. All told it probably worked out to about 1/4 cup, but as with much of this, you should probably just do it to taste. With everything else done, we finally added the vermicelli, a mung bean thread. Growing up, I used to know it as xi fen (pronounced: she-fun), and I loved the stuff. It was in college when I first heard the term “vermicelli,” and since then, I had a bit of confusion as to exactly what it was that I loved so much. I just remember the little bundles of dried noodles that Mom would have in the pantry that she’d put in soups or we’d have for the (infrequent) hot pot dinners. The one time I bought them in college, I found them by pattern-matching the packaging in an Asian food store. I got it right that time, but recently we made the mistake of buying rice noodles and it just didn’t cut it. It’s gotta be the mung bean. We now have a pink netting bag of Lungfung brand vermicelli, each bundle of noodles tied off with two pieces of thread, just like I remember it. I threw two bundles in, and gave it about 5 minutes to cook through and then it was serving time. Hot, savory, rich, and yet…clean. A little crunch of bamboo shoot (and I’m usually not a big fan), cabbage that’s barely there, clear noodles and yummy chunks of melt-in-your-mouth wintermelon. Ahhh. Oh yeah, I love me some wintermelon soup.